The tax department provides a number of options to verify ITR before final submission. On completion of the submission and verification process on part of the taxpayer, the IT department begins the processing work of the details provided in the return for verification and analysis by the tax officials. On self-online tax return, preparation and submission by the taxpayer, the tax department in return notifies him about the status of his return as ‘Successfully Verified’ or ‘Successfully e-Verified’. During the process, the department looks for discrepancies between the tax details provided and the actual tax liability to be paid. After successful completion of processing, the taxpayer is notified with the status as ITR processed. Successfully e-verified: If the department shows return status as ‘Successfully e-verified’ it means the return has been duly submitted to the IT department but is pending for processing. Submitted and Pending for e-verification: This might be displayed when the return is not successfully e-verified or pending to be verified manually (I.e. sent to the department by the taxpayer but the department didn’t receive it yet). Processed: It means the IT return duly verified, submitted and processed by the department. Defective: The status of the return might show defective if isn’t filed according to the provisions of the law. If the department founds any discrepancy, the department might serve a notice for the same or may refer the case to an assessing officer. The assessing officer may contact the taxpayer through different means and may ask to provide sufficient evidence for claims and assertions to process the return. Also Read: How do I file a TDS returns online? How to check your ITR status? Step 1: Locate to the homepage of the official tax department website from here. Step 2: In the left sidebar click on ‘ITR Status’. Step 3: A new page will open, put PAN details, acknowledgment number as received on filling of ITR. Step 4: Fill in the captcha and Submit. 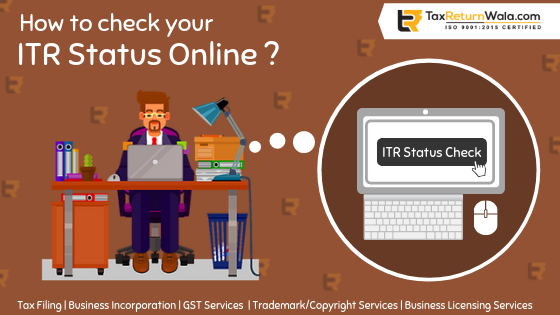 The screen will show the status of ITR as verified or in processing. Step 2: Click on ‘My account’ > View Returns and Forms and select Income tax returns and the assessment year. After submission of the IT return the tax department checks and notifies the taxpayer about the discrepancies found if any. Details, as sufficed by the taxpayer during online tax return preparation, will be latterly be processed and the department will issue a notice in normal, as specified to be sent under Section 143 (1) to inform taxpayer about the successful submission of return and its acceptance. The department issues the refund as claimed if it does not found any discrepancy. But in case of discrepancies found, the department will alert the taxpayer for issues under section 143 (1). While in some cases, the CPC (Centralised processing Centre) of the Income-tax department sends or transfers the ITR to an assessing officer for processing, this is generally done in cases where the return involves complexities and require the help of an assessing officer to step in. It is always advisable to take help of a dedicated tax expert for your online tax return preparation.